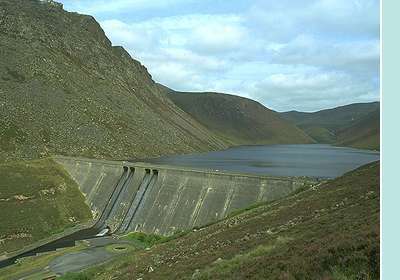 Ben Crom overlooks the Ben Crom Reservoir, situated upstream from the older Silent Valley Reservoir. It was constructed in 1957 to meet Belfast's growing demand for water. 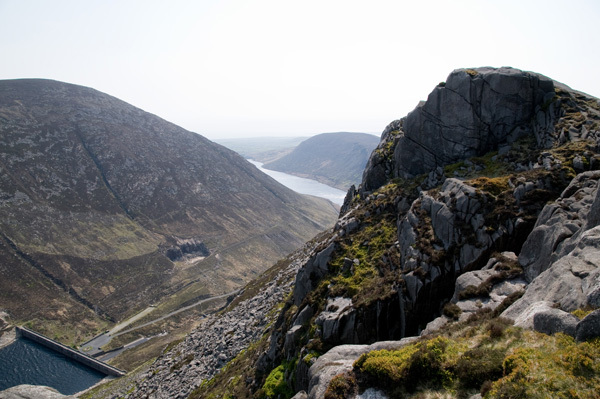 Ben Crom is the 485th highest place in Ireland. 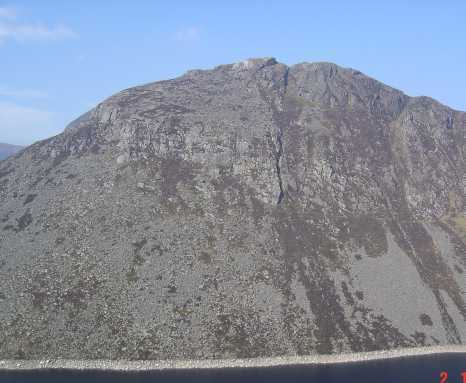 Ben Crom is an excellent example of a mountain as a game of two halves, rising as it does in a relatively benign fashion from the raised plateau sprawling south-eastwards from Slieve Meelbeg. From this direction it pales in comparison to the nearby citadel of Doan, but beyond its summit it collapses dramatically in cliffs and scree to the Ben Crom dam. The summit is reached in comparative comfort from any walks that explore the higher hills to the west: a number of paths cross the easy gradients from this direction, but due attention must be paid to the bogginess of the ground. We set out from a parking spot at J311 315 B for the Hare’s Gap via the Trassey Track under powdery blue skies with a slight spring chill in the air. The light reflected luridly off the towering wet cliffs below Slievenaglogh as we wove a route up over the boggy and rocky slope to gain the Hare’s Gap. Here the fine spring weather had brought out a number of people who swarmed around the Mourne Wall like gnats! We beat a hasty retreat from shrieking children and barking dogs to the relative calm of the valley opposite, descending towards Ben Crom Reservoir. The path was unclear in places and periodically boggy underfoot but we soon reached the spot where the Kilkeel River tumbles down into the reservoir over a series of small waterfalls. We picked our way across the river on the tops of granite boulders, pausing awhile to enjoy the sight of the water which in places cascaded chaotically downwards in a rush of whiteness, showering thousands of glistening droplets into deep and secretive lime green pools beneath, or flowed languidly over smooth granite in large scallop-shell patterns. The pathway skirting the reservoir looked deceptively level from higher up but involved climbing over boulders, clambering upwards to avoid eroded areas and dropping in and out of small gullies conveying the last of the run-off from the recent snows. 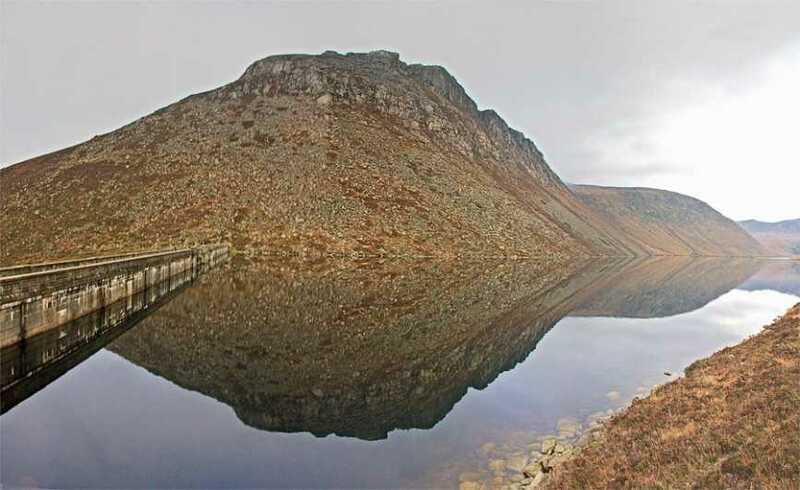 Boulders fringed the reservoir in a gleaming white ring; opposite towered Ben Crom, eastern slopes stretching wickedly upwards to a shattered granite face containing several deep gashes, the far left of which cast an ominous shadow but looked climbable. We traversed the wall of the dam and turned right to scramble up and over a tumbled mass of angular granite boulders to draw level with the beginning of the gully (route upwards described separately), enjoying the croaky cries of ravens that were soaring high above the indigo waters of the dam. 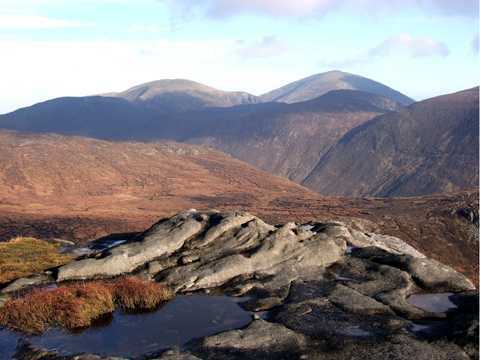 The gully delivered us close to the summit that offers striking vistas of Slieve Binnian, Doan and Slieve Bearnagh, granite sentinels guarding a fairytale kingdom of wild bog and moorland fringed by the sea. We progressed north via a maze of peat hags amid very squelchy bog to join a path skirting the lower slopes of Slieve Meelbeg. Passing above Blue Lough we spied a rising moon, rich and full as clotted cream, casting its mysterious, elemental reflection in brackish water. Beyond, Slieve Bearnagh’s jagged tors were etched majestically against a purpling sky. Calling all walkers/scramblers. I have just spent the most enjoyable 7 hours of my life in the company of a small but fiesty lady, her name is Ben Crom. Start from the car park at Annalong and head for the saddle at the northern end of Binnian. As you know, you are looking down upon Ben Crom Resovior, standing behind which you'll see the lady herself. Make you way down to the dam, cross and rest for a while. Turn right and then go (which ever way is easiest for you) up the bouldours ( or grave as someone once described them from the photos). The first gully you'll come accross is NOT to be attempted, you will know this place as it casts an obvious shadow on the mountain and is damp even on dry days. Head round another 10 mins to discover the great gully. You cannot miss it close up. Time to scramble up one if not the steepest gradients in the mournes. Don't worry about the right hand bend at the top, it's very steep but short (remember 3 points of contact) and pretty short. 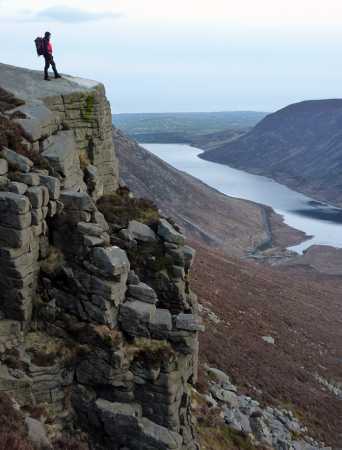 Welcome to the best view in the mournes, not via boggy marse or crappy path, you have justed begun to ..............climb. View all the peaks and enjoy all the resoviours. If you stuck in Annalong carpark then there is a path to take down is via the Silent Valley side of Crom and then home by same route. If possible arrrange to get picked up by someone at splega or newcastle. Then, as a pair of gents we meet on Crom said "the world's your oster"
We then went on to a pleasent hike up Doan and then over to spelga. Total trip 6 to 7 hours max.